A question on the exit polls during the US presidential election was which “presidential quality” mattered most. Interestingly enough, it was not experience, nor good judgment that people deemed the most necessary quality for a president: it was their ability to “bring needed change” (39%). That was also the only quality where Trump, lagging behind Hillary on all others, scored highest, at 82%. Among those who Clinton (in the biggest error of her campaign) described as a “basket of deplorables,” there seemed to be a lot of people who just really wanted change. After the Dutch election, Europe let out a sigh of relief, with headlines exalting that the tide of populism had turned because far-right politician Geert Wilders hadn’t won. This shouldn’t have been big news, as the polls running up to the election had already indicated that Wilders, leader of the right-wing extremist Freedom Party (PVV), was not going to. Most narratives concluded that populism in the Netherlands was subsiding due to this modest gain of the PVV: an easy conclusion but a questionable causal relation. Equating the electoral result of rightist-extremist parties with the degree of populism in a country is not only faulty: it is dangerous. Still this happens on a regular basis and has been prominent in the reporting done on the Dutch election as well as the upcoming elections in Germany and France. This rhetoric goes hand in hand with describing populism as the reason contemporary democracy is under threat, rather than considering the failing of contemporary democracy as the cause of support for populism. It was interesting to witness the unusual amount of attention paid to the Dutch election by the international media, and it increasingly became clear that much of it, especially the attempt to frame the election as the “key test” for the rise of populism (as e.g. the BBC does), placed the election within a narrative that didn’t convincingly fit. Any narrative that portrays Mark Rutte (former and future prime minister and head of the center-right VVD party, which has now won three successive elections) as “conquering populism” is faulty in many ways. Still, this is the version of events most reported in international news, as a glance at the Guardian, TIME World or Reuters indicates. Even media in neighbouring Germany (e.g. Der Spiegel) confirmed this narrative. If (Dutch) news media were more nuanced and inquisitive, and less reliant on obscure polls or “global trends,” the fact that the Freedom Party “only” got 13 percent of the vote wouldn’t come as such a relief or surprise. Articles that frame the Dutch election as halting a wave of populism only confirm the grandiose narrative that populists like Wilders and le Pen have worked hard to establish: it was Wilders himself who tweeted — after Trump got elected — that a Dutch wave of patriotism would be next. A cover of TIME Magazine featuring France’s National Front head Marine le Pen and Wilders under the heading “Can Europe Survive the New Populism?” published on the 20th of March seemed to confirm the severity of the situation. Rutte followed suit by often repeating his fear that after the US elections and Brexit, the Netherlands would follow suit, and stating the day after the elections that the Dutch “woke up to normality” and there was no “populist revolt,” emphasizing a highly sensationalized narrative while grossly understating the actual change that took place: the historic diminishment of the three main parties in the Netherlands shows a significant dissatisfaction with them. Much of that dissatisfaction is voiced in populist terms. However, the mere three-percent gain for Wilders’ Freedom Party indicates that “populism” can no longer be equated with support for his party, and the term should be defined more clearly. The reality is that, with 13 parties entering our parliament—the largest of which earned a mere 20% of the vote—our electorate has never been more dispersed, and coming in first or second in the election has rarely meant so little. It is unprecedented that a coalition of four parties will be necessary to form a majority government in the Netherlands. The VVD, the center-right liberals and party of our current prime minister (with a tenure to date of 7 years), got 20% of the votes, losing 8 seats in parliament with respect to the 2012 elections. Although the PVV, our right-wing extremist party, came second, they got only 13% of the vote. The PVV was followed closely by the CDA (Christian center-right) and D66 (pro-European center-left), who each got 12% of the vote. Relatively speaking, the largest win was for the green leftist party, Groenlinks, which gained 7%, thus securing 9% of the overall vote. 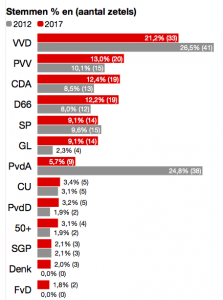 Our center-left labour party (PvdA) saw a historic loss in popularity this election cycle, garnering only 5.7% of the vote this election compared to 25% in 2012. What these statistics might already indicate is that when Die Welt calls Rutte ”Einen Abend lang der Held Europas” (the hero of the Netherlands and Europe), it is a gross simplification of the electoral results, and the political dynamics at hand. It does, however, emphasize a narrative that both the prime minister and the feared populist Wilders desperately tried to actualize during the campaign: both signalled they were each other’s only viable alternatives; both skipped most debates that all the other major parties participated in, thus signalling their importance with their absence, and instead debating each other one-on-one, on live TV. Putting aside the “zweikampf” narrative, the facts are that the ruling party suffered a modest loss, close to 5%, and the populist PVV earned a modest gain of 3% (still 2.5% of votes short of its peak in 2010), tailed by two other parties that got only half a percent fewer votes. Taking into consideration the changing political dynamic in our country, there are 3 other parties that had a larger relative gain than Wilders’ Freedom Party. When headlines say that the “tide of populism has turned” I would argue that if the term merely refers to extreme right-wing populism, there never was a significant Dutch tide to begin with. Moreover, all larger parties have made it clear they will not form a coalition with the Freedom Party — an unprecedented situation — and with an 80% voter turnout (the highest in years), it seems that most of the voting population (up to 87% non-PVV voters) either aren’t bothered by this refusal or agree with it. Either way, there has been little to no protest regarding these pledges against the Freedom Party. What is it then that makes these reactions by media and politicians like Rutte and Schulz so dangerous? As The Democracy Index 2016: Revenge of the “deplorables” report by The Economist Intelligence Unit (EIU) rightly notes, “Populists have mobilised people to become engaged in the political process and to vote, and have opened up debate about big questions that have often been ignored by the mainstream parties.” The refusal of politicians to see this “populist backlash” against the established political order as a consequence, and not a cause, of the failings of contemporary democracy will only exacerbate that dissatisfaction. The EIU report rightly notes that “The trend towards declining political participation, which has been a feature of all the advanced democracies in recent decades, is a threat to the future of democracy. Democracies do not end when they become ‘too democratic’; they begin to founder when they exclude the demos.” Populism should be seen as a sign that, despite people’s declining trust in their democratic representatives, and declining political participation, they are not apathetic towards politics. Claims have been made (e.g. by The New York Times) that the Netherlands has become “ungovernable,” as the six largest parties only collectively account for about 75% of the votes this election cycle, which stands in contrast to the three parties that sufficed for this number in 2003. This alleged ungovernability is not something that is self-evident from inside this country, and I also question the assumption of a highly polarized political landscape: in the Netherlands, politics brings a multi-faceted, highly diverse set of priorities to parliament. Electoral diversity is also contributed to by the different ways in which the parties convey their (sometimes quite similar) message to voters. Single-issue parties (such as DENK, 50+, and PvdD) have gained ground, but this plurality doesn’t necessarily lead to a deadlocked parliament: the Party for the Animals (PvdD) proved itself to be extremely effective after arriving in parliament, increasing the number of motions considered by parliament concerning the agriculture sector by 14%. Do left and right find themselves opposed when the majority of policy decisions need to be made? Yes. But whether this opposition will be more stark than in previous years is not clear. While the various parties’ stances have become more visible and pronounced, thanks in large part to new media, I’m not sure the actual gap between parties should still be thought of within a binary framework. With the emergence of new parties, where they stand on the spectrum often depends on the issue at stake. A diverse parliament will require a reworking of governing and negotiating practices. 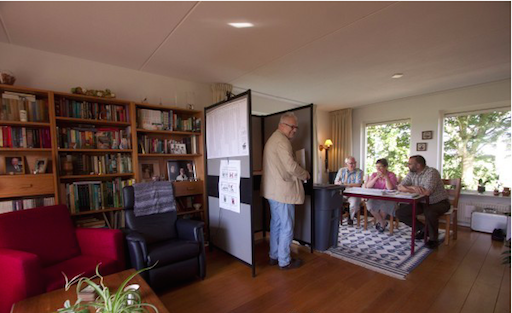 But the election also made clear that the Dutch electorate demanded this change, and was ready to participate in it, breaking the all-time record of casted votes. As the EIU’s Democracy Index of 2016 highlights, this is a good sign: “In Europe and the US the main features of regression are a declining trust in political institutions; other weaknesses in the functioning of government; … increased voter abstention and declining political participation.” The Dutch election reversed this trend. Meanwhile in the United States, for the first time, the country fell below the threshold for a “full democracy” in 2016 and is now considered a “flawed democracy” due to the erosion of confidence in government and public institutions. In my opinion, the sapping of this confidence, abetted by politicians’ unwillingness to truly listen to their constituents, made citizens feel the need to vote for the candidate who best represented change, even if they didn’t wholeheartedly agree with him. In reports on the Dutch elections, two different facets — the will for political change and right-wing extremism — were grouped together and conflated by journalists and politicians alike. I hope that, in the face of other upcoming EU elections, this narrative, which feeds sensationalism and misinformation, will be scrutinized, revealing that the situation might not be as dire or as extreme as portrayed. This is not to deny that most center-oriented parties in the Netherlands adopted more conservative and right-wing rhetoric during the last campaign, something which seemed to have contributed to the demise of the center-left labour party (PvdA), which suffered a tremendous loss, especially of lower- and middle-income voters. But the left Green Party (GroenLinks) presented the most ambitious — some say radical — plan our country has ever seen to combat climate change and income inequality, and secured 34% of young people’s votes (aged 18-34), the most favoured party by this age group. Quite contrary to most other parties, the greens kept a positive message throughout the campaign, which resulted in a fourfold increase of votes for their party. Through this GroenLinks secured the largest relative win this election. If there is one thing to take away from the Dutch elections, let it be the following: the population is hungry, not for right-wing policy, but for change, and right-wing extremist parties do not hold a monopoly on breaking with the status quo. Please note that I rounded up the percentages—they are approximations.